The Rotary Club of Newcastle is gearing up for their annual RibFest, the weekend of May 24-26, 2019. This weekend event will take place in the downtown parking area in front of the library off Ledden Street. Running concurrently will be the city sponsored “Striper Cup” fishing competition, so the waterfront will be turned into a beehive of activity. Hailing from London, Ontario, Crabby’s BBQ Shack has over 20 years in business and a long-standing track record of award-winning barbeque. Crabby’s uses a “low and slow” technique, baking their ribs at a low temperature for a long time which allows the flavours to stay in the meat. They have won awards from all over. For more information, please visit www.CrabbysBBQShack.com. Originally from Motley, Texas, now out of Zorra Township in Ontario, Texas Rangers began touring the Canadian circuit within the last 10 years, wining awards every year. The company has grown and become a contender among the best in the North American Ribfest Circuit. Their sauce has a nice flavour with slight heat and ribs are finished on an open flame. Everything is Bigger in Texas!! 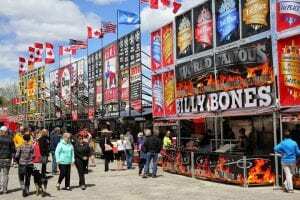 Billy Bones BBQ and crew from Ontario have traveled the entire United States, Canada, and even Ireland winning state and national barbeque competitions. Their BBQ sauces have won many awards. They offer BBQ sauces, BBQ rubs, hot sauces, competition dry rubs for ribs and pork, chicken and more. Billy’s BBQ products are original and tangy, with a hot smoky bite. For those less daring, they have a mild which is the same without the bite. For more information, please visit www.BillyBonesBBQ.com. Fat Boys BBQ is a family owned business and operates a portfolio of more than three independent rib teams. In 1999, company founder George Kefalidis opened the first rib team in London. Fatboys BBQ ribs are unique because they are double smoked with cherry wood and finished off on a wood burning bbq to give that smoky flavour. The ever popular Tater King french fries will also be on site with their fresh, hand-cut fries, having just enough crisp for the perfect bite. Also popular with the Miramichi crowd are their blooming onions. For the third year, a Vendor’s Market will be on site all weekend with a variety of goods for the public to peruse. Looking for an original branded hoodie, jewellery, homemade jams, biker gear, or freshly squeezed lemonade, it is all here. See the complete list of vendors on our website. Besides food, the weekend will be full of entertainment, including a rib eating contest, human foosball competition, children’s activities, musical entertainment, and a multi-faith church service. Rumour has it last year’s winner of the rib-eating competition, local wrestler “Homeless Bob” will be back to defend his title. Sign-up will start soon and remember to not eat breakfast that morning. Human Foosball is the result of taking the popular foosball table game to the next level. This event will be the fun one to watch all weekend, and always draws a crowd. Teams of six compete in a small enclosure to put a soft soccer ball through the goals. The only drawback is you have to keep holding onto the poles that come across the enclosure, which limits your movement. A quick search of YouTube will quickly bring up videos of participants having a lot of fun. Entries will cost $300 for a team of six to ten players, and teams can be comprised of any combination of friends, family, or co-workers. Registration for foosball is available online at the RibFest website. Children’s activities on Saturday will be under the direction of The Point Church. The church group never fails to come up with entertainment for all. Past events have seen jumping castles, mazes, dancing, and lots of smiles. For a detailed list of this year’s activities and times, check out the RibFest website as we get closer to the event. Sunday activities will start with an open-air church service at 11 am, hosted by The Point Church. The service is open to people of all denominations, faiths, and walks of life. Seating will be provided. Uplifting music and a unique, energetic approach to faith blends perfectly with our other festival activities. There will be live entertainment all weekend long, with singers, dancers, and other groups taking to the stage in support of this charitable event. The feature act on Friday night will be Sonny and the Jets, from 9:30 to 12:30 inside the heated tent. The following night will feature the band Crossover, again from 9:30 to 12:30. Admission is free. For more information on the Rotary RibFest, check out www.RotaryRibFestMiramichi.ca. Remember to Like the “Rotary Club of Newcastle” on Facebook and follow us on Twitter @RotaryFest – see you Downtown!